This audio installation was inspired by people’s stories of their lives in Glenbuchat, taken from oral history recordings collected by Isobel Gilchrist within the community. The stories were rich and vibrant in content, full of memories and laughter. Extracts of voice recordings were interspersed with natural sounds of the glen and forest.The audio was channelled through six speakers attached to trees in the circle to give a surround sound. The name 'Where Long Shadows Fall' makes a connection between the ephemeral shadows moving over our landscape as the earth rotates and the transient 'life shadows' of people in a landscape of place and time. The site was in the heart of Glenbuchat, near the hall, in a circle of hardwood trees with a clearing in the centre. 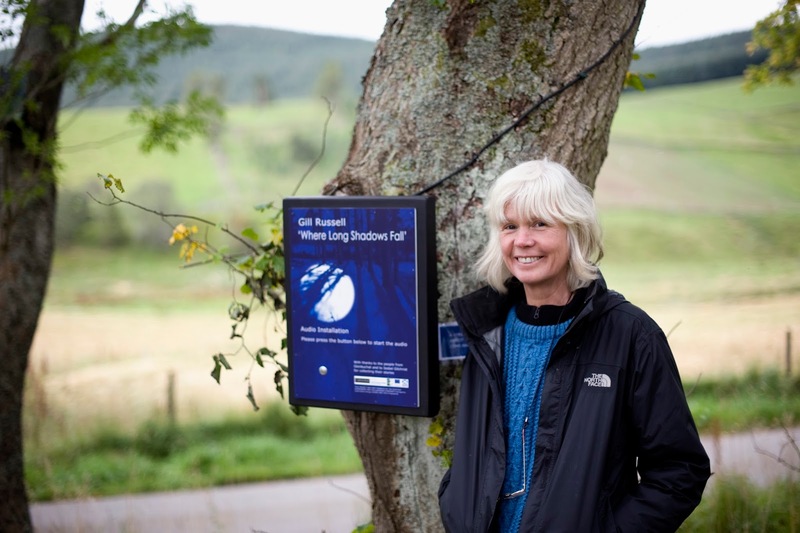 'Where Long Shadows Fall' was first created in 2011 as one of two installations set in the Cairngorms National Park to celebrate UNESCO Year of the Forest. It was re-intalled in Sept 2013, as part of SOUND and Gill's Landmarks residency. BBC Radio Scotland paid a visit on site for the programme ‘Out of Doors’. They recorded some of the audio installation and interviewed Gill Russell. The interview was broadcast twice.